Chris Pesto, a junior drama major, decided to take action. 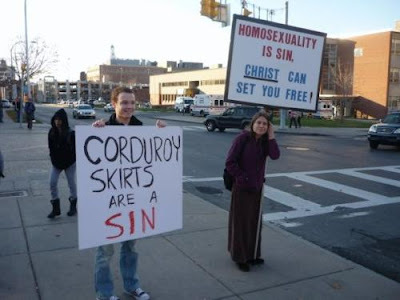 Today (Wednesday, November 18th) I left my voice lesson and noticed two adults on campus holding signs that said “Homosexuality is a sin”. First, I would just like to say that I support people with their own opinions. I think that everyone is entitled to their right to think what they want. However, when someone comes on my campus, where I pay tuition to live, I don’t think it’s appropriate to rub such a hateful sign in someone’s face. I decided that because this woman thought it was okay to make me feel uncomfortable in my home, I would retaliate and make her feel just as uncomfortable, if not more. What a fantastic story. That picture made me laugh out loud. Congratulations on your bravery!! !